An integrated retirement village in Woodlands has clinched one of the world's most prestigious architectural awards. 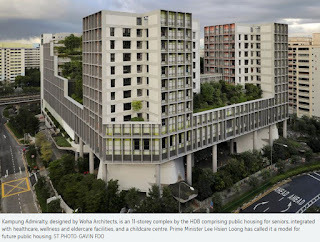 Designed by WOHA Architects, Kampung Admiralty won Building of the Year at this year's World Architecture Festival, considered the Oscars of the architectural world. The entry beat 535 projects from 57 countries to snag the top prize, announced at a gala dinner last Friday in Amsterdam. The newly developed Kampung Admiralty retirement community has been held up as an example of what the Government is doing to transform education, healthcare and housing to improve lives. 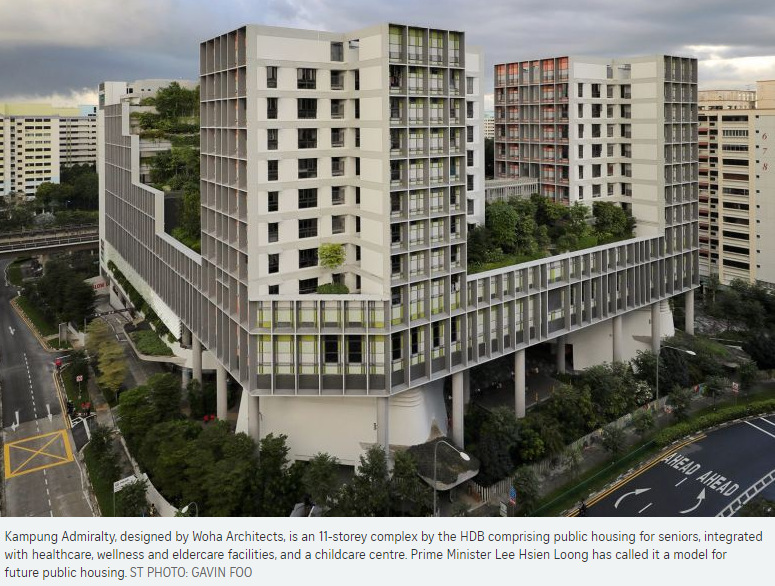 The 11-storey complex by the Housing Board comprises public housing for seniors, integrated with healthcare, wellness and eldercare facilities, and a childcare centre. It took in its first residents in August last year. At his National Day Message in August, Prime Minister Lee Hsien Loong described it as a "high-rise kampung where residents are out and about, socialising with family, friends and neighbours, and yet never too far from home". He added that it is a model for future public housing. Mr Paul Finch, programme director of the World Architecture Festival, said: "The judges admired the project for the way in which it dealt with the universal condition of longevity and health treatments, social housing provision, and commercial space, which enabled substantial public-realm benefits. "This hybrid building also incorporates a huge amount of greenery in a series of layered levels which have generated welcome biodiversity." The winner was selected by a "super jury" of four highly respected representatives of the global architectural community - Mr Li Xiaodong, Ms Nathalie de Vries, Mr Frederick Cooper Llosa and Ms Lesley Lokko. The building has won multiple awards, including a commendation for commercial architecture at this year's International Chapter Architecture Awards, as well as the Best Commercial Mixed-Use Future Project award at the 2016 edition of the festival. Singapore Institute of Architects president Seah Chee Huang said the momentous win is a big achievement not only for WOHA, but also for Singapore. "It demonstrates the talent and quality of Singapore architects, to shine on the world stage and do our nation proud," he said. "I also see the award as an affirmation by the global architectural fraternity of our country's success in championing urban-social alchemy, through the synthesis of people, density, greenery, wellness and liveability." This is not Singapore's first win at the architectural awards. In 2015, it won Building of the Year for The Interlace condominium in Depot Road by OMA and Ole Scheeren. The cooled conservatories at Gardens by the Bay clinched the same title at the festival when it was held here for the first time in 2012.